After reading Hugo and Nebula awards-winning novella, Binti (reviewed here), I knew I wanted to see more from the awards list. First up- Ender’s Game by Orson Scott Card. In this first science fiction novel of the Ender Quartet, the world is at war- not with itself, but with a horrifying and technologically advanced hostile alien race. The last battle seemed to wipe the “Buggers” out, but the government agencies of earth know they’ll be back. In preparation for their return, they commence selective genetic manipulation and breeding of child geniuses and soldiers. One such brilliant manipulation is Andrew “Ender” Wiggin. Though his sadistic brother, Peter, and gentle sister, Valentine, did not make the cut, Ender appears the perfect balance of his siblings’ excesses- to his hated brother’s disdain and his loving sister’s fear. He is drafted into the orbiting Battle School that rigorously trains child soldiers from around the world. Ender excels and quickly becomes a respected leader in the Battle Room- the place where children play at war in zero gravity. But the harsh atmosphere, training, and community of Battle School takes its psychological toll on the young warrior, and Ender must wrestle with social isolation, academic pressure, and the looming fear of the Buggers’ return. Will Ender become the general the earth needs? And if he can’t, will earth survive? Ender’s Game is, without a doubt, one of the best books I’ve read all year. While the initial plot points itself are not re-inventions of typical sci-fi themes, Card crafts a story that you’re invested in from the very first chapter. Much of this is due, in my opinion, to his ability to write fascinating, complex characters; characters who reveal their true selves through their actions even as they say something else entirely. Their duality makes them feel all the more human, and even in his supporting characters, Card manages to recreate depth, individuality, and self-awareness with few words. Card’s characters make sense, and thanks to that, their actions and the consequences of those actions make sense, too. It’s easy to see how familial dynamics affect Ender and inform his interactions with his peers and teachers, and how he must overcome his past if he hopes to succeed at Battle School. And, while I don’t want to post any spoilers, I was floored by the climax and conclusion even as I understood that Ender’s struggles and choices would inevitably bring him there. I was just as impressed with Card’s ability to draw together heavy thematic elements in Ender’s Game. Through Ender’s journey, Card writes with subtlety and nuance the trauma of war and war-time mentality, the burden of leadership, the question of what defines humanity, and ultimately, the problem of good and evil. It left me pondering those questions myself. I don’t think either of us arrive at an answer (well, at least not in this book), but I think the mark of a good story is one that leaves you thinking about it afterward. Card certainly accomplishes that. 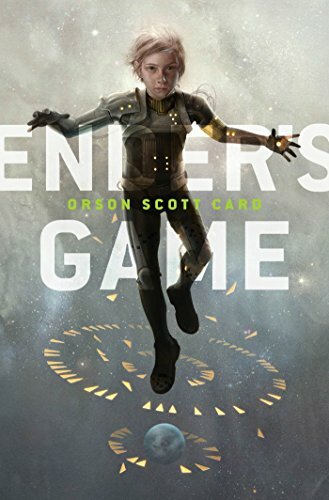 As far as detractors for Ender’s Game, some reviewers find issues of implausibility with the intensely advanced abilities of the genetically modified children, as well as problems with some of Card’s own ideology that filters through the pages. I felt that the former was easily explained away by the rules governing the world, and as to the latter, I suppose that ends up being a matter of preference. In short, I loved this book and would absolutely recommend it. What are your thoughts on Ender’s Game?